Chamomile is probably one of my favorite non-caffeinated teas and I think this brand in particular tastes the best. When I would drink this it helped to soothe my sore throat and filled my heart with warm fuzzies. a runner up was the Throat coat tea by Traditional Medicinals in the flavor Lemon Echinacea. I just didn’t find myself reaching for this tea as much, though when I did, it really did help my throat. So my sweater does not look this nice, honestly it’s kind of sloppy looking, I’ve had it for awhile, but it gets the job done when it comes to keeping me warm inside my house where no one else can see it. I decided to let you look at other options as well, just because. Snuggly Blankets and Awesomely Amazing Movies/TV Shows. Lastly, there’s nothing like a good snuggly blanky when you’re sick. this one just looks so soft, especially the Sherpa part. As for movies and tv shows, obviously that is up to you, I personally was happy with the walking dead and the metalocalypse rock opera, Metalocalypse: the Doomstar Requiem, both were highlights in my sickness fog. Another thing that helped me tremendously was Dayquil and nyquil, until my husband informed me that when I take Nyquil I become a moaning zombie in my sleep, so yeah that only happened once. So as always, thank you so much for reading and let me know what you do when you are feeling under the weather in the comments below. 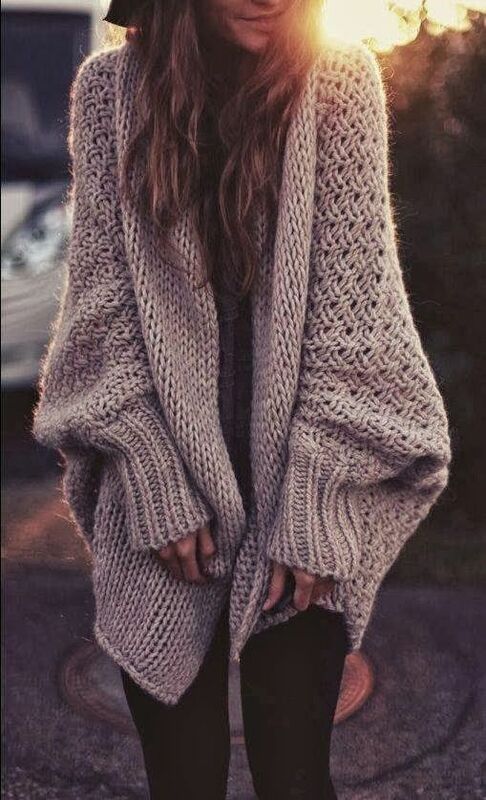 This sweater just looks amazingly soft and cozy. I can see myself wearing this all the time, to the point of my husband asking me to wash it. (not that, that has ever happened. don’t judge me) . The neutral color also makes me happy. I just absolutely love the light pink blouse and tory birch flats. the bag and watch are also amazing and the sparkle of the tank top is a nice touch. however the earrings, sunglasses and pants I can take it or leave it. the idea of an all black outfit with beautiful gold accessories is just incredibly chic to me. love everything! This outfit is just magical. I love the flowiness of the skirt and the simple black top and how she anchored it with this artfully tied belt. i’m also pretty jealous of the camera she’s using :). last but not least this. i’m kind of obsessed with finding the perfect pair of flared jeans, i’m not saying this particular pair are the perfect pair for me, but on her they look beautiful. I even like the hat, and i’m not a hat person. I think this is a perfect fall outfit for Alaska, it just looks warm and flowy, if that makes sense. that’s all, I hope you enjoy my rambling opinions, haha. these are my very favorite items this week from my pinterest board “My Pretties”, if you want to take a look at what else is on there,click here http://www.pinterest.com/bumblebee907/my-pretties/ .